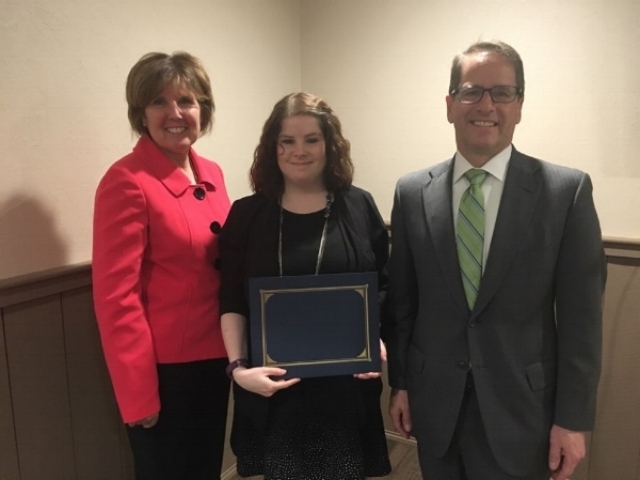 Congratulations to Ms. Jennifer Udelhofen, who was honored at a special luncheon this week as one of 23 nominees for New Hampshire Teacher of the Year for 2019. All the nominees are going through a rigorous application process, including presentations of their work to members of the selection committee. Finalists will be selected soon, followed by school visits from the committee. See photos from the luncheon below. Our 8th graders had a very successful Job Shadow Day, learning a lot about several careers, from architecture and veterinary medicine to acting and producing. Thanks to Diana Fontaine for coordinating all the paperwork, schedules and transportation. The 7th graders are already looking forward to next year’s event. We’ve had quite a Spirit Week, with students sporting a variety of colorful outfits to fit each day’s theme. Today the Student Council will lead them all through a series of games in the Gym, with each grade wearing their special class colors and serving up some new hairstyles to build school spirit! April 9: Awards 2:15 pm in the Gym. Parents are welcome to attend! April 27: Special program with Valerie Newton’s ballet corps; 8:30-9:30 in the Gym. A reminder that every Friday, beginning today, Abbey Group will be providing complimentary lunch to all our students through the end of the school year, along with a year-end barbecue for everybody as well. We hope everyone will take advantage and enjoy ‘Free Lunch Friday’ this spring. We hope to see everyone in the Cornish Gym tonight as the 8th graders take on the staff and parents in our highly anticipated annual basketball game. Tip-off is at 6:30 pm, so come on out and cheer everybody on!